The present study aimed to evaluate the anti-inflammatory and analgesic activities of the ginsenoside metabolite compound K (CK) and its mechanisms. Mice model of xylene-induced ear swelling and rat model of carrageenan-induced paw swelling were used to evaluate the effect of CK on acute inflammation. The analgesic effect of CK was evaluated on heat-, acetic acid-, and carrageenan-induced hyperalgesia. The levels of prostaglandin E2 (PGE2), cyclooxygenase-1 (COX-1), and COX-2 in carrageenan-induced rat paw swelling and gastric mucosa were detected by enzyme-linked immunosorbent assay (ELISA). COX-1 and COX-2 expressions in carrageenan-induced rat paw swelling and gastric mucosa were detected by western blotting. In vitro effect of CK (10−9, 10−8, 10−7, 10−6, 10−5 M) on COX-1 and COX-2 activities was evaluated by measuring the production of 6-keto-PGF1α and PGE2 in rat peritoneal macrophages. CK at doses of 7, 14, 28, 56, 112, and 224 mg/kg alleviated xylene-induced ear oedema, whereas CK at 40, 80, and 160 mg/kg alleviated carrageenan-induced paw oedema. CK at 224 mg/kg showed an analgesic effect against acetic acid-induced pain. 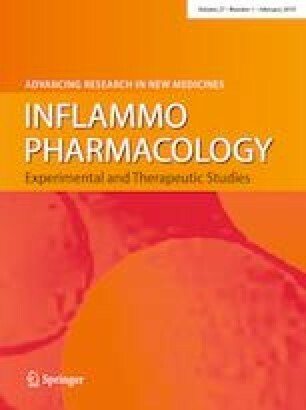 CK at 40, 80, and 160 mg/kg significantly increased rat inflammatory pain threshold, but had no effect on heat-induced pain threshold. CK at 10, 20, 40, 80, and 160 mg/kg reduced PGE2 level in the paw tissue, but showed no effect on that in the gastric mucosa. CK at 20, 40, 80, and 160 mg/kg decreased COX-2 expression in the paw tissue and gastric mucosa, but exhibited no effect on COX-1 expression or on COX-1 and COX-2 activities. CK exerted anti-inflammatory and analgesic effects, possibly by reducing the catalytic synthesis of PGE2 via downregulation of COX-2 expression. Jingyu Chen and Min Si contributed equally to this work. This work was financially supported by the National Natural Science Foundation of China (Nos. 81503084, 81330081). WW contributed to the design of the study, served as the study coordinator, and helped to review the manuscript. JC designed the study, performed the experiments, collected the data and wrote the manuscript. MS, YW, LL, YZ, AZ helped perform the experiments and interpret the data. All authors read and approved the final manuscript.